https://matcha-jp.com/en/6861 Visit Suma Temple, Kobe - Japanese History And Unusual Statues! 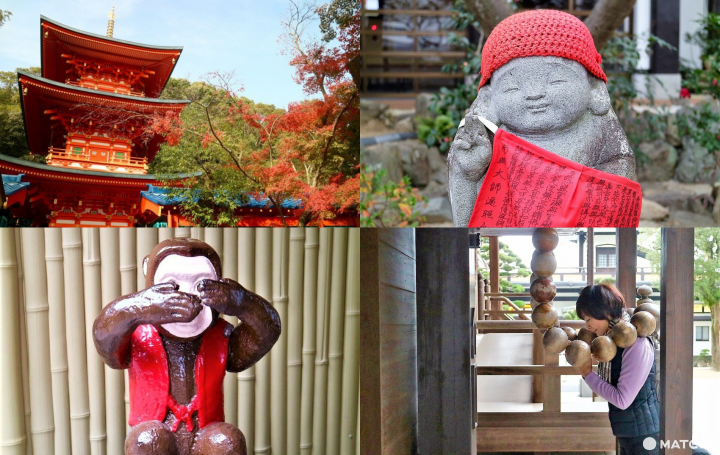 Visit Suma Temple, Kobe - Japanese History And Unusual Statues! Suma Temple in Kobe has over 1,100 years of history, and its unique, modern statues make it a fun place to visit. Take a look at what makes this temple so charming and worth visiting. Suma Temple, located in western Kobe, was founded more than 1,100 years ago. Its official name is Joyasanfukusho Temple and is the main temple (*1) of the Shingon Suma sect. *1: The headquarter temple of a religious sect. Shingon, a Buddhist denomination, was started in the ninth century by the monk Kobo Daishi, also known as Kukai. Kobo Daishi remains an important figure even today. There is a hall that enshrines a statue of Kobo Daishi on the west side of the main building. A temple festival with food stalls and a lively atmophere is held on the 20th and 21st every month. Though Suma Temple has a long history, it is also modern, with unique statues throughout the grounds, and its priests stream lectures on YouTube. There are plenty of highlights that can’t be found at any other temple. Let’s take a look. There are six Warabe Jizo statues wearing cute caps and aprons, posed in different positions, with their arms up in banzai (*2) poses or giving peace signs. Warabe means child in Japanese. Statues of Jizo, who is said to be a Buddhist figure who saves people from their suffering through mercy, are common in Japan. *2: A position that expresses joy and other similar positive emotions. It is said that if you put these giant prayer beads on and make a wish, Kobo Daishi will grant it. Prayer beads, usually worn on one's wrist when praying, are woven together with string. These beads are so large that they can’t be completely supported by just one person. Be safe and give it a try. This is a prayer wheel on top of a turtle with the seven lucky gods inscribed on it . The seven lucky gods: Daikokuten, Ebisuten, Bishamonten, Fukurokuju, Hoteison, Jurojin and Benzaiten. They are said to grant wishes. Prayer wheels, common in Tibetan Buddhism, are used to pray by spinning them. You can climb on top of the turtle to pray, but avoid climbing on top of the gods. The Bujikaeru frog ("getting safely home frog") has eyes and a neck that turn. If you want to be surprised, rotate the eyes. If you’re worried about debt, turn the neck. The device has its origins in Japanese expressions; “rotating your eyes” means you’re astonished, while “being unable to turn your neck” refers to stress about having debts that you can’t repay. The five monkeys will display different movements when rubbed on the head. “See no evil, hear no evil, speak no evil, Buddha is watching, don’t be wrathful.” The teachings of Buddha are inscribed on the monkeys. Suma Temple has more interesting things to discover that will amuse visitors of all ages. The 25-meter tall, vermilion-lacquered three-storied pagoda on the grounds will draw your attention. The mountains are directly north, and the contrast of red and green emphasizes their beauty. This is a great place to take photos at Suma Temple. In the latter half of the 12th century, the Genpei War broke out, which was a civil war between the Genji and Heike clans. The two factions fought for six years. The general pictured above is Naozane Kumagai. Suma Temple was also a battle site, and is thought to have been an encampment for Minamoto no Yoshitsune of the Genji clan. The Heike general above is Taira-no-Atsumori. Known for his mastery of the flute, the statue recreates his episode with Naozane Kumagai. You can also see his beloved flute on display here. Suma Temple also conducts activities to preserve traditions, such as single-stringed zither performances (*they require a fee). You can call ahead if you want to hear it played (078-731-0416). According to legend, the noble Ariwara no Yukihira became depressed after being sent to Suma from Kyoto in the Heian era. For amusement, he attached a string to a plank he had found at the beach and used it to play songs. There is an English guide at the temple office across from the main building. Make sure to take a copy. These are red prayer candles. Write a wish and make your offering to the deities here (200 yen). Light your candle and offer it at the front of the main building. The flickering flame creates a serene, solemn atmosphere. There are various good luck charms inside the fortune slips given out at the temple office. There is a small daruma included with the fortune pictured above (200 yen). There are charms for academic success and good health. The Zodiac netsuke carvings are particularly popular with overseas visitors (300 yen). Netsuke were used as fasteners in the Edo era to weight down small items like tobacco pouches. Suma Temple has beautiful scenery all year-round. The cherry blossom season is from late March to early April. In the fall, there are maple and gingko trees that paint the temple grounds. In the wintertime, even the main building is blanketed in snow. We received a message from the chief priest’s deputy at Suma Temple, Yonin Koike. The chief priest is responsible for the temple, and the deputy assists him. Koike: Suma Temple has many sides. It is a place that relays Buddha’s teachings, a place where history still remains, a place that transmits culture and tradition, and a place where you can discover many interesting things. There is also natural beauty all year-round, with cherry blossoms and fall foliage. Please come visit the temple. Suma Temple has a rich history and a high reputation while being a friendly place where you can chat with the monks, like Koike. When you go sightseeing in Kobe, drop by Suma Temple.